The official blog for the Economic Development Division of the American Planning Association. Planning connects us at the American Planning Association's 2019 National Planning Conference, April 13-16 in San Francisco. 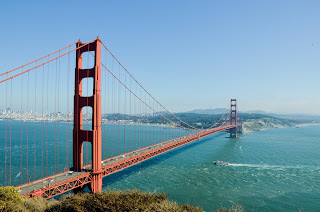 NPC19 offers everything planners expect from the year's premier planning conference: a great location, fresh ideas to take home, and new connections to advance their careers. Learn more and register at planning.org/npc. We are honored to share that the winner of the 2016 Hunter Award for Excellence in Community Planning for the Economic Development Division of the American Planning Association is the City of Norfolk, Virginia and its “Global Initiatives Fund.” This project supports local exporters with patient, flexible capital to support their export related activities. The City, which is home to the busiest port on the east coast, is serving small to medium-sized enterprises with this program. The review committee was especially intrigued by the boldness involved in taking up such a global topic and the local level. Join us in honoring Norfolk at our Division Reception during the NPC, Monday April 4, 6:30-8:30 pm, at the Sheraton Grand Phoenix, in the Maryvale Room. The economy and economic development are well-represented on the NPC agenda for this year! We encourage you to attend the sessions and workshops below, brought to you by your Economic Development Division. We know we’ll see you all at our annual reception, Monday April 4, 6:30-8:30 pm, at the Sheraton, Maryvale Room. Add these events to your online conference schedule HERE! 2:30 p.m. - 3:45 p.m. This facilitated discussion will include updates from the APA Task Force on Planning and Economic Development, and conversations about how planning supports economic development. 8:30 a.m. - 11:30 a.m. Cost: $65. Take a walking tour of the Arizona State University Downtown Phoenix Campus and Phoenix Biomedical Campus, the focal point of creativity and innovation in downtown Phoenix. Experience how economic development, public-private partnerships, historic preservation, and quality of life connect. 9:00 a.m. - 10:15 a.m. Learn how planners can play a role in public-private partnerships (P3s) that create large-scale, economic development. Explore how these roles create place that is reflective of the community. 2:45 p.m. - 4:00 p.m.
Fiscal impact of development continues to garner increased attention. Conventional wisdom is that suburban development is a financial drain while urban development is a boon. This may be true in many cases, but only part of the story is being told. This session will explore the whole story. 4:15 p.m. - 5:30 p.m. This session will provide an overview of housing as an economic development issue. Learn from two case studies highlighting the issue and two techniques for demonstrating the importance of housing in economic development. 6:30 p.m. - 8:30 p.m.
7:45 a.m. - 12:45 p.m. Cost: $90. Having a major airport near downtown modernizes and connects its growing urban environment. See how Phoenix Sky Harbor International Airport uses planning for regional multimodal transportation, renovating terminals, accommodating major sporting events, and preparing for airport land reuse. 7:45 a.m. - 1:15 p.m. Cost: $90. Since 2008, Phoenix’s adaptive reuse program has provided regulatory relief and streamlined the development process for renovating existing buildings for new uses. The workshop will visit three projects and evaluate opportunities and challenges associated with reusing existing buildings for new uses. 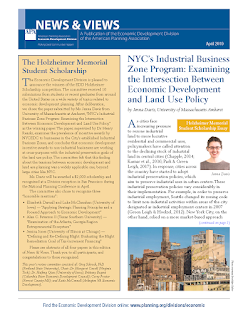 We are honored to share that the winner of the 2016 Holzheimer Memorial Student Scholarship for the Economic Development Division of the American Planning Association is Judd Ullom, a 2015 graduate of the Virginia Tech Master of Urban and Regional Planning program. Judd submitted a selection from his MURP capstone entitled, "Creating a Living Museum to Promote Awareness and Support for Cultural and Economic Diversity in Clarendon (Arlington, Virginia)." The project used technology and social media as a means of cultural preservation to create a low-cost and adaptable method of promoting and preserving economic and social diversity in areas of rapid redevelopment. The project includes five documentary films about the neighborhood and the incorporation of those films into a ‘living museum.' Join us in honoring Judd at the NPC Division Reception, Monday April 4, 6:30-8:30 pm, at the Sheraton, Maryvale Room. We also wish to acknowledge two other applicants with Honorable Mention – Akshali Ghandhi (Cornell University) and Mindy Kao (Georgia Institute of Technology). Ghandhi 's insightful study focused on "Economic Development Planning in Ethnic Retail Corridors: Insights from Chicago’s Devon Avenue. Kao submitted an excellent paper on "The Practical Challenges of Urban Manufacturing in Atlanta." The division also extends its thanks to the scholarship committee. Chair Margaret Cowell (Virginia Tech), David Bieri (Virginia Tech), Shari Garmise (Association of Public and Land Grant Universities) , Shana Johnson (Foursquare Integrated Transportation Planning), and Greg Schrock (Portland State University) are appreciated for their tireless efforts. Applications are invited from Master's level students enrolled in PAB-accredited planning departments in the United States, as well as individuals who have graduated from those programs in the past year. 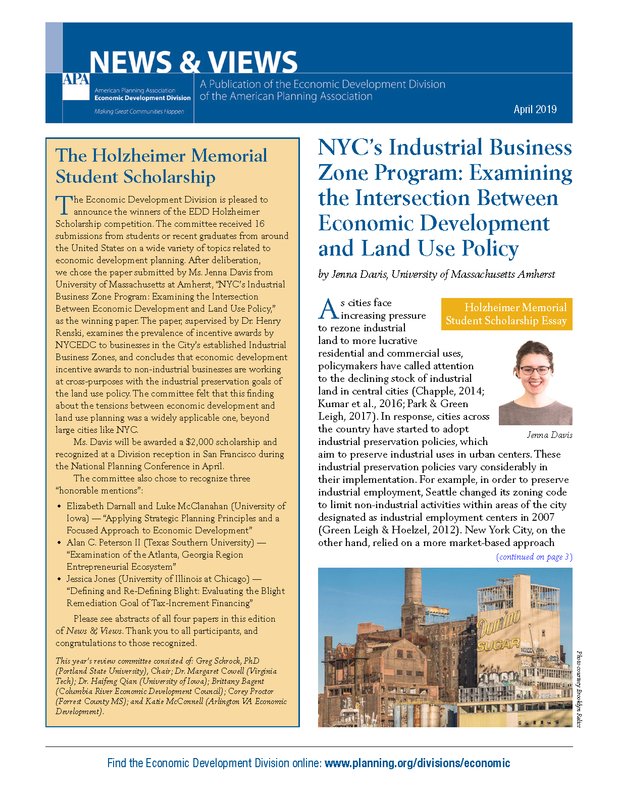 The scholarship, once called the Economic Development Division Travel Scholarship, has been renamed in memory of longtime APA member and economic development visionary, Dr. Terry Holzheimer of Arlington County, Virginia and Virginia Tech. The $2,000 award is a scholarship provided by the APA's Economic Development Division. Winners are encouraged but not required to use the award money to support attendance at the national APA meeting in the spring. The application materials should include an original student paper or work that is 2,500 words or less, as well as a submission form, which must include the name and e-mail address of a faculty member willing to speak to the applicant's abilities. Due to the word limit, submissions may reflect adaptations of student work, including term papers, capstone and studio projects. The original student submission should speak to practitioners about a substantive topic related to economic development in the United States. We strongly encourage students to think broadly about the topic of economic development. The winning paper or project will satisfactorily demonstrate the following: topical relevance to economic development practitioners with a clear discussion of why practitioners should care about the findings; soundness of data collection and methods; quality writing; student authorship; and originality and creativity. The committee reserves the right to withhold the award should no submissions comply with these criteria. The winner will be notified by February 26, 2016 and the scholarship will be presented at APA's National Planning Conference in Phoenix, April 2-5, 2016. The paper will also be published on the Economic Development Division website and distributed electronically to division members. American Planning Assocation, Economic Development Division. Awesome Inc. theme. Powered by Blogger.